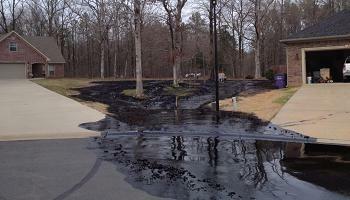 File photo of the 2013 oil spill in Mayflower. Central Arkansas Water objected to the proposal, saying it doesn't require the Pegasus pipeline be moved away from the Lake Maumelle watershed. The pipeline crosses beneath the watershed, which supplies drinking water to an estimated 400,000 residents in central Arkansas. The Justice Department says two subsidiaries of Exxon Mobil have agreed to pay almost $5 million in government penalties from a 2013 oil spill in a central Arkansas community. Class-action status has been granted in a lawsuit against Exxon Mobil stemming from a 2013 pipeline accident in Mayflower. The Arkansas Democrat-Gazette reports U.S. District Judge Brian Miller in Little Rock ruled in favor of Arnez and Charletha Harper. They can represent people who currently own property that is subject to an easement for and physically crossed by Exxon's Pegasus pipeline, which runs from Texas to Illinois. They want the easement canceled or the pipeline removed or replaced.